You may customize your portal with your logo, a background image for the login page, and an accent color. To access these options click Admin from the library drop down menu, then Account Settings. Select the file you wish to be your company's logo. The logo you select will immediately pop up as your portal's new logo. Select the image you wish to appear as your portal login background. For best results use an images that is 2560x1440. 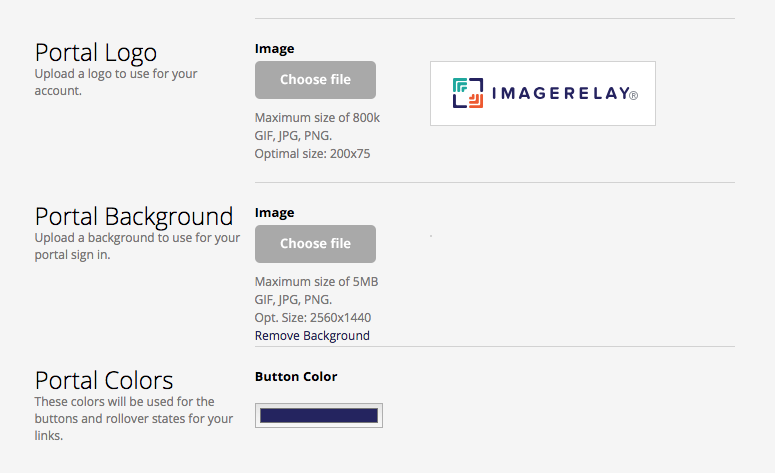 You can then preview how your new background image will look by clicking Portal Preview at the bottom of the page. Click on the rectangle below Button Color. You can then choose the color of the portal buttons and of the rollover states for links. It should automatically update your portal once you have chosen an accent color.